Port Moresby associations dominated the Cup and walked away with the champion's trophies in the 5x5 Men's and Women's events. 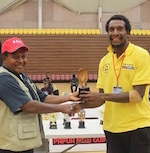 Mr. Lawrence Baro, President of Kupiano Basketball presented the trophy to Purari Muri, captain of PMBL Black. Whilst PMBL President, Allan Bossougu, presented the women's trophy to Mary Saddlier of POMWBL Gold. Men's 3x3 - PMBL (1), Daru (2nd), Lae 3rd). Women's 3x3 - POMWBL (1). Other teams were not able to make it. Deputy PMs Encouragement Awards - Mt Hagen women and Slots men's teams. Congratulations to Kupiano, Daru, Kavieng, Mt Hagen, Alotau, Lae and all POM associations. Basketball Federation of Papua New Guinea (BFPNG) and FIBA launched the logo of the FIBA Oceania U15 Championships, 2018 at the Taurama Aquatic and Indoor Centre in Port Moresby City today. The logo which heavily features the "Lakatoi" is a symbol of the Port Moresby's residents that reminds them of their history of trade with various cities across Papua New Guinea. BFPNG President Nick Daroa and FIBA Oceania Competitions Manager Amanda Jenkins were on hand to unveil the logo to a sizeable crowd at the world-class Taurama Basketball court. "We are happy and proud with the logo of the U15 Oceania tournament that features the Lakatoi which you can see all over the Port Moresby," said. Daroa. "PNG is looking forward to hosting another world-class event and to show everyone our hospitality to our guests," he added. Jenkins arrived in the capital city of PNG on an official visit to assess the readiness of PNG in hosting the first step of the Qualifier of the U18 Asia Championships. "PNG has always been a great host, we were here in the 2015 Pacific Games and also the 2017 Melanesia Cup. We look forward to another successful event in December," said Jenkins. "With the APEC 2018 in November and our tournament in December, it only proves the viability and the hosting prowess of Port Moresby. The FIBA Oceania U15 Championship will host 7 nations including Australia, New Zealand, Samoa, Tonga, Fiji, Guam and the host nation. PAPUA New Guinea is looking forward to hosting the Fiba U15 Oceania Championships in Port Moresby for the first time. 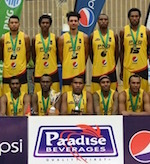 Basketball Federation of Papua New Guinea (BFPNG) executive officer Stephen Damien said Australia, New Zealand, Guam, Samoa, Fiji and PNG would be competing at the championships from Dec 2-9, showcasing new talent in the region. 'This is a unique and great opportunity for BFPNG to give our young athletes some exposure to international competition,' Damien said. 'We hope the competition will build our experience and also encourage more participation in communities around the country. 'PNG will hold its U15 national championships in July, where we will select players for the December event. 'BFPNG has started its community outreach programme in Port Moresby and Alotau to inform clubs and associations to start preparing for July. 'Next month, we will move to Lae, Goroka, Kerema, Buka and Kokopo with our clinics and information drive. 'We thank Fiba and the Australian government for funding this initiative. 'We thank Fiba for giving the right to BFPNG to host the U15 Oceania Championships, and the PNG Sports Foundation for supporting us.' Meanwhile, BFPNG executive Karo Lelai said David Crocker and Amanda Jenkins of Fiba Oceania were in Port Moresby last week to firm up plans and preparations for the December championships. Lelai said this was a major undertaking by BFPNG.